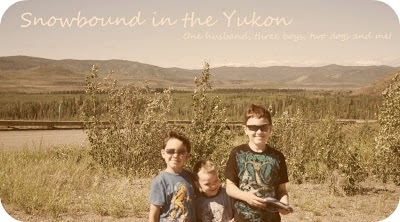 Snowbound in the Yukon: No, I'm not lost.. Kids are busy, especially two year olds. Things have just been busy, I've never had more than 5 minutes on-line in the last week or more, probably more, it sure feels like it. Little M has gotten busier and more rotten. Of course he's his usually chipper self and funny and lovable but when he doesn't get his way his follows his older brothers lead now and has a fit. It's worse than a 5 year old really! Right now Snow Baby is getting crankier by the second and I think I've been feeding him all day. Little M has decided to not potty train himself anymore and will only wear his pull ups now and not underwear and will hardly glance at the toilet. I was feeling entirely too smug about it for my own good anyway! Little M has also been battling a cold the last three days, he woke up Sunday at 1am and threw up. Then after that he's been okay, he stayed home with daddy all day Sunday while I and the other two were out. Well that didn't last long, this is the next day now. You see I'm finding very little time for myself. Right now SmartGuy and Little M are watching Little Einsteins, I gave in for my "no tv" rule during the week and Snow Baby is in his seat next to me being very quiet for a change. Snow Baby is good, sleeping lots at night for me and is usually awake a lot during the day, mostly in the evening which is fine with me. Little M is still battling his little cold and goes through periods of lethargy (if that is a word? I don't know). He's still into everything though. SmartGuy is his usually smart self but now he's totally argumentative with me, not is a defiant way, he just feels he knows everything and needs to tell me I'm wrong! Oh the joys of parenthood! I love my boys, I love my boys, I really, really do! Me! Let's see all I do right now it take care of the boys, cook, clean, change, dress, feed and start again! I did manage to go out for a walk yesterday while hubby watched the boys sleep. No I'm not bitter! Seriously though, I'm having a heck of a time making time for myself. I'm feeling good natured about it but at the same time feel the need for a break. The baby is fine it's dealing with a child who can't seem to sit still and another child who can't seem to sit still. I'm just tired from them. I did manage to rearrange the living room since the windows reflect on the tv. I've been on and off in the exercise department. My hip still hurts me when I walk, it's the sciatic nerve I guess, that general area. It's sort of depressing since I have another physical ailment right now and I keep thinking why is my body doing this. I literally started crying on my last leg home from my walk yesterday because I can't understand why it's happening. I'm going to go to Whitehorse next Tuesday because I have to see the dentist and I have to some how get a referral from the dentist here who is retired so I can get my travel and check up paid for. It's a crazy world I tell you. Plus I guess there is a dentist who is coming here April 30 - May 2. So I may end up having to wait until this new doctor is here. Other than that things are good we have our plane booked, our hotel and rental car booked and we just have to find a ride to Whitehorse, if we can't we'll just squeeze into my little car, all five of us! It can be done! Now I really need to try and organize some of my craft stuff so I can actually work on something at Craft night tonight. Oh, time for you must be so hard right now! If I had some advice to give it would be... why not take a hot bath? KIDDING. I know how useless saying something like that would be. Good luck to you in the upcoming weeks. Hopefully as the baby settles more and more into a routine, you can find some you time!